I've been seeing many of my friends starting blogs, and people have been asking me about blogging lately, so I felt it would be appropriate to put it all into a post! I'm in no means a blogging expert, but if you want to get into blogging (whether for personal posts or sponsored posts/less personal posts), then this simple list should help you get into it! It's not too detailed because most people I know want to start a blog as a diary, but if you have any further questions, please don't hesitate to ask me! Do you want to write all about your faith? Do you want to document your relationship with that person? Do you just need a diary? Or do you want to chronicle your adventures in school, travel, food? Pick what you want to write about and stick to it. If you intend to write about multiple subjects like I do, then you can just categorize yourself as a "lifestyle" blogger. Just make sure that you know what you want to express to your audience when you come up with this. 2. What are you going to name your blog? Depending on if you want to blog just for fun or yourself and/or (eventually) for compensation/as a job, this may or may not be very important to you. Regardless, pick a name that is relevant to your topic. Some people just use their name as well, which you can do too. If you can, try to use the same URL as your blog's name. Somewhere on your blog, tell us about yourself! When people visit your blog, they want to know who you are or at least get an idea of who you are. Other than the homepage or post I'm reading on a blog, I always like to look at peoples' "about me" pages. I like getting to know the person behind the blog. You can read my "about me" here. I just changed it up! 4. Leave a place for people to contact you! You never know when someone might come across your blog and be touched or want to ask you more questions or want to work with you. Leave an email address or social networks for people to connect with you. You want to be accessible to your readers, especially if they aren't friends/family who don't already know you! 5. Last of all, be confident in your blog! When I first started blogging, I was really scared and intimidated to share posts on my personal Facebook because I was scared of being negatively judged by people that I knew. While I'm still working on this tip, I'm mostly confident in sharing my posts online, especially to people I know. When you write or post anything online, just know that you automatically open yourself up to criticism. People may just try to hate on you, but it's your blog and it's your voice! However, I will also say, that while I don't want you to hide your beliefs, please do not rudely state your opinion in an ignorant way. That's not cool. There's a way to state your opinion in a stern way that can still respect the opposing opinion. But other than that, I think you should be bold and brave in writing your blog. If you are writing personal posts on your blog, kudos to you! I know just how hard it can be to be vulnerable for the public, but just know that there are people who will read and care about what you say. If you feel comfortable enough to write it, people will support you. I hope so much that while these tips are fairly simple and vague, I hope they can help you. If you have any more questions, please email me at kriselle@livinandlovin.com. You can always just comment below as well, haha. Check out my part 2 to this post if you are looking for more basic tips for starting a blog! 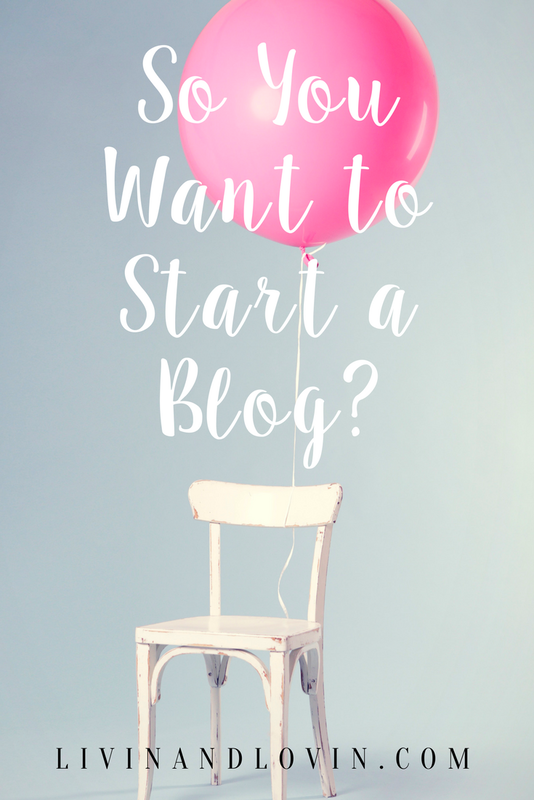 If you want some more in-depth tips, tricks, and worksheets to help you start up your blog, sign up for my FREE blog course, "I Want to Start a Blog!" Love this post! These tips are so helpful when you first start a blog!! Good morning! I'm in your SITS Tribe Building Challenge and I just wanted to introduce myself. I look forward to reading your posts!